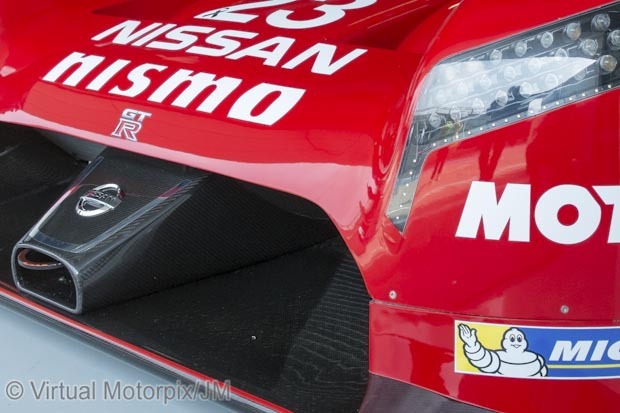 The front wheel arches of the 2015 Nissan GR-R LM Nismo look rather bulbous. This car is dressed in the colours of the Manchester City F.C. Much has been written about the quirky and innovative Nissan GT-R LM Nismo. The educated motoring press has divided opinion, as do the drivers of competing teams. The fans of endurance racing are probably more vociferous in their opinions, to the point of ridicule. I, personally, am excited by the prospect of another LMP1 team pushing for honours. The first real surprise, when the Nissan GT-R LM Nismo was launched was the fact that it was front wheel drive. The last time that a front wheel drive ‘won’ at Le Mans was in 1928 by an Alvis. Alvis came 1st and 2nd in the 1500cc class, 6th and 9th overall. Whilst a very large proportion of road cars are front wheel drive the majority of racing cars are rear wheel drive and the purest will say that rear wheel drive or four wheel drive is the only sensible configuration. It is 86 years since a front wheel drive car shone at Le Mans. I can’t help feeling that there is a reason for this. Maybe 2015 will give a credible alternative option. Unique nosepiece of the Nissan GR-R LM Nismo with its rather special radiator and cooling air intakes. There is no mistaking that the styling of the Nissan GT-R LM Nismo is as radical as the engineering under the skin and one particular crowd pleasing LMP1 driver was heard to ask “which end is the back?” A major part of the styling is influenced by aerodynamics and the resultant down force, this is maybe contributed by the upward and rearward facing exhausts. Why else are they placed there? The 2015 Nissan GR-R LM Nismo nosepiece from a slight angle, and if Ben Bowlby had anything to do with the design, then it will work! I asked both Jann Mardenborough and Alex Buncombe what they thought about the placement of the exhausts and were they a distraction especially when flames shoot out on over run, especially at night? Alex has not driven the car at night, so didn’t foresee a problem. Jann’s experience was different. He has driven the car at night and calmly said, “It gets your attention. It’s only happened once when we were testing anti-lag software.” He went on to say, “When it happens, you can’t see anything.” I asked if he thought it will be a problem during the race? He confidently replied, “No, it won’t happen again, we can’t afford to waste fuel.” I hope this is more a function of regulation, and not budgets at Nissan. 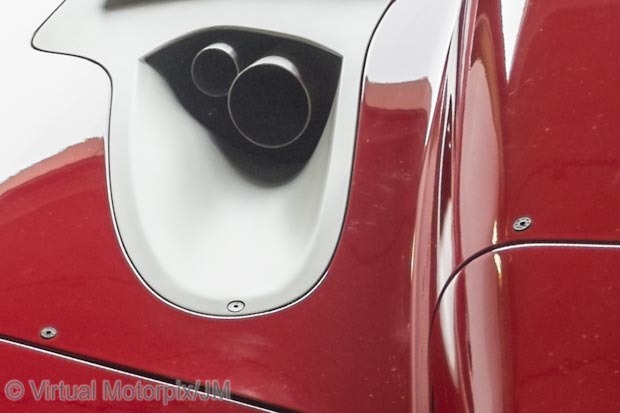 The exhaust outlets for the 2015 Nissan GR-R LM Nismo, which exit the engine cover on either side ahead of the cockpit. Throughout the short life of the Nissan GT-R LM Nismo project, Nissan have been very open with the media for example insisting that photographs of the innards are tweeted as soon as possible unlike the other teams who go out of their way to block photographers at all costs. Nissan are slated to run 3 GT-R LM’s at Le Mans and the PR machine embraces this but many are sceptical about this. How could a car with the backing of Nissan fail a crash test, what other fundamental errors have been made? After much speculation, Nissan have arrived with three LMP1 cars for the test day, as well as two LMP3 cars in order to give the rookie drivers qualifying experience. 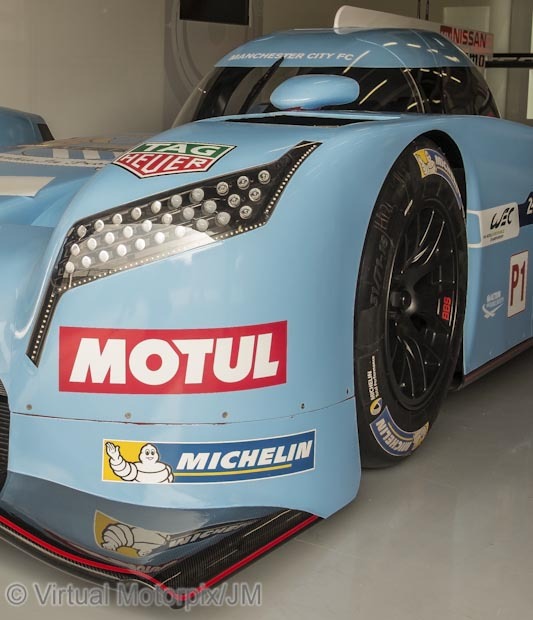 Drivers of LMP1 Hybrid cars have all commented on how complicated the new generation of cars are to drive and to balance performance within the regulations especially in respect of fuel usage. One question that strikes me is: why haven’t Nissan placed experienced LMP1 drivers in the cockpit to move the development of the car forward? I sincerely hope that the Nissan GT-R LM Nismo confounds the critics, cynics and logic, but I can’t help wondering if it will be another ZEOD?